As some people know, I graduated May of last year, and since then I have been out of school. Being out of school has made me realize how much I love school; maybe not school itself because everyone knows how much I procrastinated on assignments, but I love learning. If there is one thing I want to do for forever, it is to keep learning. Being out of school has made me mildly crazy; I feel like I have so much free time but yet nothing really seems to be fulfilling it in the manner that I would like. Since I am not quite ready (both financially and mentally) to go back to college for my masters, I try my hardest to get my learn on whenever possible. With all this extra time I have on my hands I seem to spend WAY too much of it on Pinterest (don’t judge me too harshly). If you know anything about Pinterest you know that it will make you want to be crafty and it will make you want to bake and make feasts but yet it will also make you want to exercise like a crazy person to burn off all of the calories of the stuff you just baked. 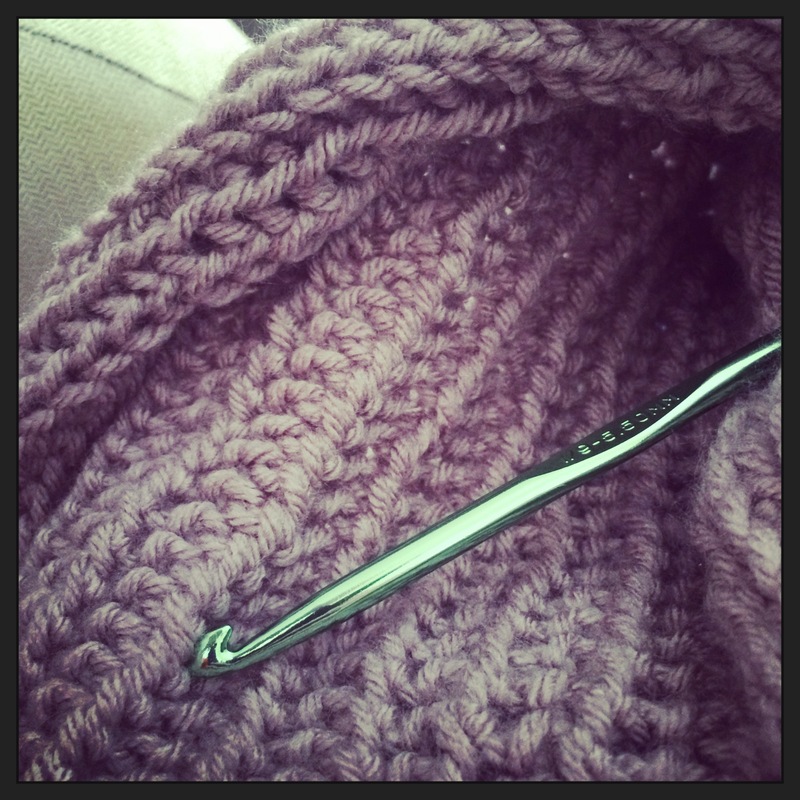 Anyway… Pinterest introduced me to the age-old time passer; crocheting. I would pin item after crocheted item until one day I decided I was going to learn to crochet. I remember the day pretty clearly, it was a nice Saturday in October I was sitting on the couch pinning while Marlboro Man was doing whatever he does (apparently I don’t remember it THAT clearly). I proposed the idea that we do something with our weekends, if we were going to sit at home lets at least be productive and have something to show for the weekend; I suggested we learn how to crochet. To my surprise he was game for this adventure so off to Hobby Lobby we went. At Hobby Lobby we picked up starter kits on crocheting and knitting (he picked knitting because the associate told him that she thought it was easier.. pfft). We headed to the yarn aisle and picked out the most colorful, fun yarns we could find; we were making scarves. I remember picking a pale purple color one of the Hobby Lobby private label brands, looking back on that now I would probably never get this yarn again because I am now a yarn snob and this yarn is far from soft and it gets too shredded when worked with too much. Long story short we got our kits and our yarn and headed home. The kits we picked up came with pictures and a DVD; pretty much everything to get started with the yarning. I’m not going to lie learning how to crochet was not easy, I swear I read every page in that starter book a million times, I watched the DVD a handful of times, but the most informative medium for learning to crochet came from YouTube. The people of YouTube are AH-MAZING! I swear you can learn how to do just about anything from a YouTube video; I wish I had the drive to make YouTube videos. This was the first scarf I crocheted, it literally took me about 3 weeks. I was too concerned about everything looking uniform, my stitches were WAY too tight and maybe my OCD for organization got in the way. I felt like it took me FOREVER to finish that scarf, but I was so excited that I had taught myself to do something and I had something tangible to show for it. Not having challenged my brain from May to October was really starting to take a toll on me. I felt that I was getting stupid and that if I didn’t keep learning something, anything that I would lose my curiosity. I feel that it is ridiculously important to stay curious and to challenge yourself when you have no other outside force doing so. I am sure to most people learning to crochet is not exactly the most challenging thing or even something that most people are curious about, but for me thanks to Pinterest it sparked my curiosity and it made me want to learn something new. The thing that I am loving about crocheting is that once I feel that I have learned one stitch to the best of my abilities I can move on to the next stitch, the learning right now in this elementary stage seems to be endless. My poor family and friends are probably going to be getting handmade gifts for quite awhile until I learn how to make something a little more their speed. To sum up this post; I never want to stop learning, whether it be something as small as crocheting, or learning to cook something new, or going back to school. Learning is amazing and it is underrated by people who just want things to come easily. What sparks your curiosity? What do you want to learn about or how to do that you haven’t taken the time to do before? Why not start now.